09 BP 441 Cotonou, Republic of Benin. Citation: Akpadjan F, Adégbidi H, Hodonou FD, Koudoukpo C, Dégboé B, et al. (2017) Fixed Pigmented Erythema (FPE) Simulating an Initial Double Medallion Pityriasis Rosea of Gibert (PRG). Skin Dis Skin Care. 2:22. Fixed Pigmented Erythema (FPE) is a drug reaction. Pityriasis rosea of Gibert (PRG) is a cutaneous virus due to the reactivation of (HHV7/HHV6). We report here a case of FPE, the second episode simulating an initial double medallion PRG in a young adult. Our case confirmed the assertion that toxidermia is a major simulator of the other dermatoses behind the syphilis. The term “fixed drug eruption” (FDE) was introduced in 1894 to describe a distinctive eruption characterized by recurrences of one or more circumscribed lesions in the same site, or sites, wben the causative drug is given . Fixed Pigmented Erythema (FPE) is a drug reaction that starts with pruritus and is characterized by the presence of single or multiple, round or oval lesions with a well-defined border that even allow scarring lesions to make the diagnosis. The Fixed drug eruption is one of the most common and fascinating of drug eruptions. Apart from the classical FDE, generalized bullous, extensive bilateral symmetrical, pulsating, wandering, and nonpigmenting . In every country, the causes of fixed drug eruption follow the local patterns of drug usage; these change as old drugs drop out of use and are replaced by new ones with an unknown potential for causing this type of reaction . Its evolution is also specific: in the event of reintroduction of the causative agent, the lesions recur at the same site and will heal leaving residual pigmentation . Reported for the first time in 1798 and fully defined in 1860 by Gibert , Pityriasis rosea is a common dermatosis. It is an acute self limiting papulosquamous disease, in origin affecting healthy adolescents and young adults. It is characterized by distinctive skin eruptions and minimal constitutional symptoms . Pityriasis rosea of Gibert (PRG) is a cutaneous virus due to the reactivation of (HHV7) and/or HHV6 [5,7], mostly asymptomatic and without a pigmentary sequelae. Drug induced pityriasis rosea tend to occur in older generation and resolution seen only after withdrawal of the offending drug. But FPE simulating a PRG is rare. It appears from the review of the literature that drug reactions can simulate a PRG on the one hand, as well as a conventional PRG can simulate a drug reaction on the other hand. But it is rare to have a PRG with double medallion-induced medication. We report here a case of FPE, the second episode simulating an initial double medallion PRG in a young adult. A 35-year-old patient with à history of personal atopy consults for two asymptomatic neck lesions that have been evolving for less than a week. This is a first episode depending on the patient. There would be no notion of prior drug intake according to the latter. 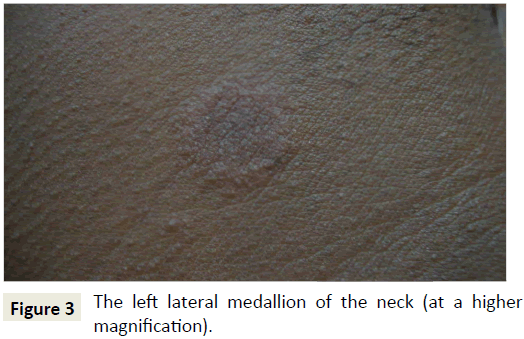 The clinical examination found two maculopapular erythematous medallions with a finely squamous surface located on the two side faces almost symmetrically. These medallions are rounded, measuring about 1.5 cm in diameter (Figures 1-4). 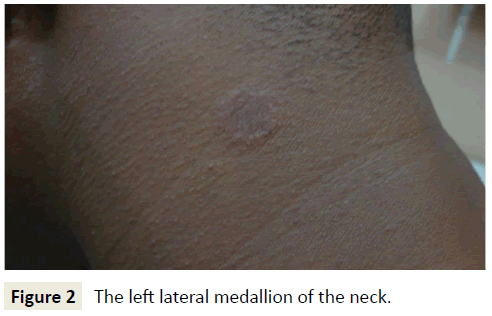 The systematic examination of the rest of the skin integument revealed on the internal surface of the right arm a large oval macular medallion of about 3.5 cm long axis, hyperpigmented, with a discreetly infiltrated erythematous border (Figure 5). The discovery of this new lesion led to a quasi-police interrogation that made it possible to specify the existence of the large medallion for several months and its pruriginous character with each treatment antimalaria by the combination artesunate+sulfa methoxypyrazine+pyrimethamine. Figure 1: Two quasi-symmetrical neck medallions. Figure 3: The left lateral medallion of the neck (at a higher magnification). Figure 4: The right lateral medallion of the neck. Figure 5: The large medallion of the internal surface of the right arm. We then conclude two different dermatoses: one FPE of the arm and one PRG of the neck beginning with an initial double medallion; or an atypical form of the same dermatosis, FPE. A stop of the antimalarial with a therapeutic abstention under surveillance has been established. A syphilitic serology requested returned negative. The short-term evolution was marked by a complete disappearance of the lesions without pigmentary sequelae on the neck but with a residual hyperpigmentation on the arm. Four months later the patient returns for a recurrence of the three medallions with a notion of pruritus and an identical evolution (Figures 6 and 7), with pigmentary sequelae on the three seats. The patient admitted that he had inadvertently taken the same anti-malarial treatment 24 hours previously. This recidivism thus made it possible to end the doubt and to retain the diagnosis of an FPE simulating a PRG with double initial medallion. 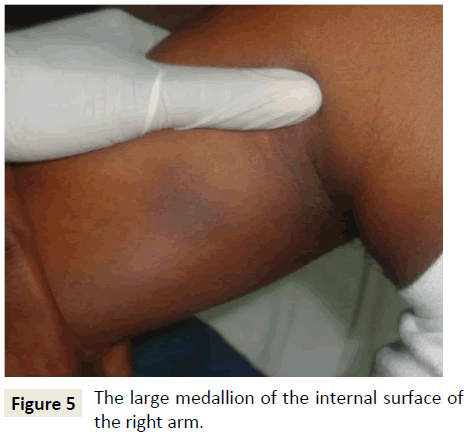 Figure 6: The large medallion of the internal surface of the right arm (recurrence after 4 months). Figure 7: The left lateral medallion of the neck (recurrence after 4 months). The atypical PRG by the number of initial medallions is well described in the literature , although rare. The initial presentation of these two lesions of the neck in our patient resembles it very well especially that it is an atopic subject. FPE is a toxidermia . However, rare cases of dietary causes have been reported . The drugs involved are numerous, evolving over time and depending on the countries concerned. In Asia and Africa, antibacterial sulphonamides are the most commonly responsible drugs , followed by nonsteroidal anti-inflammatory drugs (NSAIDs) (including phenazone derivatives and oxicams), synthetic antimalarials, Sulfamides and paracetamol. In France, the main drugs identified as FPE providers are paracetamol [11,12], NSAIDs (especially oxicams), antibiotics (beta-lactams, quinolones, sulfonamides, cyclins, macrolides), carbocistein. But many other families are concerned, such as antiepileptics, benzodiazepines, proton pump inhibitors, antihistamines, some antifungals (terbinafine, fluconazole) . The delay in the occurrence of this toxidermia is short, from 1 day to 2 weeks. This delay is reduced as re-introduction occurs and may be only a few hours after taking the medication in question . In our case, the sulfonamide contained in the antimalarial drug would therefore be more incriminated than the artesunate. According to Sharma , the lesion topography can focus on the type of the causative drug. An isolated genital disorder is often due to cyclins, an attack of the trunk and the limbs without mucous involvement in analgesics, and a generalized attack of anticonvulsants (phenytoin). Anti-infectious sulfonamides are often responsible for liver damage. This hypothesis is not verified in our case. In our patient we noticed that the initial clinical presentation of this FPE is atypical because absence of pruritus and sequelar hyperpigmentation after the first episode on the lesions of the neck. The absence of pruritus could be explained by a concomitant taking of antihistamine, ignored by the patient because he is accustomed to it because of his atopic terrain. The specificity of this clinical case is double: on the one hand, the two quasi-symmetrical medallions of the neck can easily induce the clinician in error, orienting it more towards a PRG with double initial medallion. On the other hand, the difficulty of making a diagnosis of certainty at the first consultation; because in our case it was necessary to wait for the recidivism before confirming the diagnosis. Muco-cutaneous drug reactions are side effects secondary to the intake of various medications. They are quite frequent and diverse in their clinical presentation, pathogeny, histology and prognosis. Fixed pigmented erythema has a clinical appearance feature. It is one or more erythematous macules, becoming purplish or brown. They are rounded or oval, reaching a few centimeters in diameter, and may be seated at any point of the tegument and mucous. Several drugs are responsible for an FPE. Sulfonamides are an important part of the classes of medicines in question. The PRG, although of infectious cause is often to be differentiated with PRG-like drug reactions. The initial atypical presentation of the second episode of this FPE confirmed well the assertion that toxidermia is a major simulator of the other dermatoses behind the syphilis. Orchard DC, Varigos GA (1997) Fixed drug eruption to tartrazine. Australas J Dermatol 38: 212-214. Sharma VK, Dhar S, Gill AN (1996) Drug Related Involvement of Specific Sites In Fixed Eruptions. A Statistical Evaluation 23: 530-534. Savin JA (2001) Current causes of fixed drug eruption in the UK. Br J Dermatol 145: 672-674. Valeyrie AL, Lebrun VB, Bensaid B, Sassolas B, Barbaub A (2015) Érythème Pigmenté Fixe: Épidémiologie, Physiopathologie, Clinique, Diagnostic Différentiel Et Modalités De Prise En Charge. Ann Dermatol Venereol 142: 701-706. Guarneri F, Cannavo SP, Minciullo PL, Gangemi S (2015) Pityriasis rosea of Gibert: Immunological aspects. J Eur Acad Dermatology Venereol 29: 21-25. Panda M (2014) Pityriasis Rosea Like Drug Rash-A Need to Identify the Disease in Childhood. J Clin Diagnostic Res 8: 4-5. Drago F, Ranieri E, Malaguti F, Battifoglio ML, Losi E, et al. (1997) Human herpesvirus 7 in patients with pityriasis rosea. Electron microscopy investigations and polymerase chain reaction in mononuclear cells, plasma and skin. 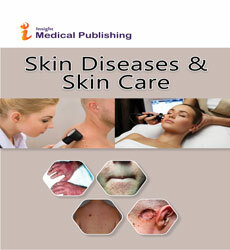 Dermatology 195: 374-378. Amer A, Fischer H, Li X (2007) The natural history of pityriasis rosea in black American children - How correct is the “Classic” description. Arch Pediatr Adolesc Med 161: 503-506. Fumal I, Sriha B, Paquet P, Piérard FC (2001) Drug-induced dermatoses, a ransom in the search for health. 56: 583-591. Allchurch LGV, Crilly H (2014) Fixed drug eruption to propofol. Anaesth Intensive Care 42: 777-781. Blaise G, Letot B, Piérard FC, Mostinckx S (2007) Erythème pigmenté fixe, protestation cutanée à l’encontre d’un médicament. 62: 601-602. Mahi I, Zehar Y, Boudghene SP (2016) Érythème pigmenté fixe induit par le paracétamolÃ¢ÂÂ¯: à propos d’un cas. Ann Dermatol Venereol 143: S46.